Injury concerns caused Pete Carroll to manage Jimmy Graham last year. Graham was an integral part of the Seahawk offense last year, but his snap count was regulated by his head coach. Despite playing with Carroll’s leash, Graham still finished the 2016 season ranked No. 10 among NFL tight ends with at least 32 targets in yards per route run at 1.91, his highest mark since 2013. 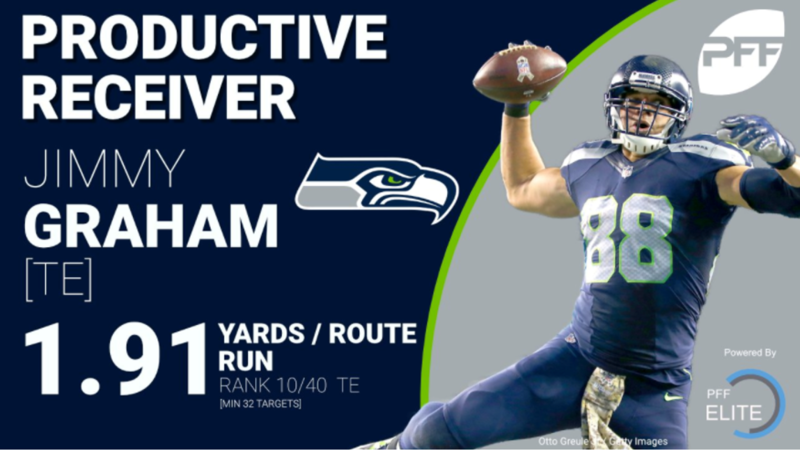 Graham’s 86.4 overall grade last season was also the highest overall grade he’s had since the 2013 season and the third-highest season grade he’s received in his seven-year career. QB Mike Glennon and WR Cameron Meredith are showing signs of having chemisty. Meredith was a productive receiver for the Bears last year and he looks to continue that trend with the new quarterback in town. Meredith played 703 offensive snaps for the Bears in 2016, and found himself as the focal point of the Bears passing attack, leading the Bears receiving corps in targets (95), receptions (66), receiving yards (894) and touchdowns (4). His PFF overall grade of 75.9 ranked second among Bears wide receivers and 51st of 115 qualifying wide receivers in the league. The third-year receiver was extremely effective when targeted deep in 2016, and posted the league’s second best a catch rate (70.0) on passes that traveled 20+ yards in the air. He ended the season averaging 2.09 yards per route run, which ranked 11th of 96 receivers with at least 44 targets, and his receiver rating (the passer rating a quarterback generates when targeting a receiver) of 100.1 ranked 34th. Should the chemistry transfer into the season, Glennon and Meredith could be a good partnership on deep routes. In 2013 and 2014, Glennon produced a passer rating of 104.2 when targeting go routes, corner and post routes, and in 2016, Meredith produced a receiver rating of 142.8 on go routes, corner routes and post routes. It’s “clear” that Rob Kelley will have the starting running back job for Washington. 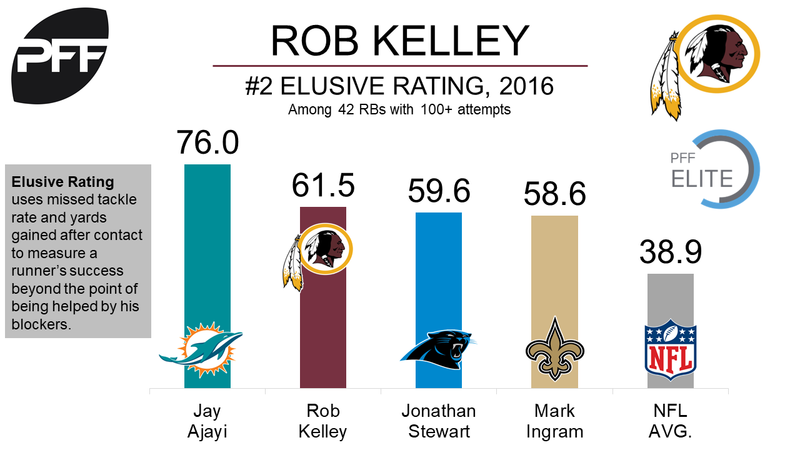 Washington has a stable of running backs, but it seems like Rob Kelley will be the guy to start the season. Kelley’s overall 2016 grade of 75.0 ranked 35th among 61 qualifying running backs. He took a backseat to Matt Jones to start the year last year, but his solid performances both last season and in training camp have earned him a starting position over 2017 draft pick Samaje Perine. Kelley was impressive as a rookie running back in 2016. He forced 36 missed tackles on 168 rushing attempts, third-most among rookie running backs. Even more impressive, Kelley was only one missed tackle behind Dallas Cowboys RB Ezekiel Elliot, who had 322 rushing attempts compared to Kelley’s 168. Ryan Tannehill left practice with a non-contact injury. The Miami Dolphins may be without their starting quarterback for some time. Tannehill as he has been a solid quarterback since entering the league back in 2012, grading well in every season; 82.0 in 2012, 85.1 in 2013, 84.0 in 2014, 81.0 in 2015 and 80.9 in 2016. His 2016 grade ranked 16th out of 34 qualifying quarterbacks. Tannehill is trying to get back to his 2013 form in which he graded as the seventh best quarterback that year. Last season Tannehill was one of the best in the business when kept clean, as his 116.6 passer rating from a clean pocket ranked fourth among all quarterbacks. However, his passer rating drops of cliff when under pressure, all the way to 49.1. The difference in passer rating between a clean pocket and when under pressure of 67.5 is the league’s largest gap. Houston Texans WR Will Fuller will be out for the next two to three months. The young wide receiver broke his collarbone during practice. 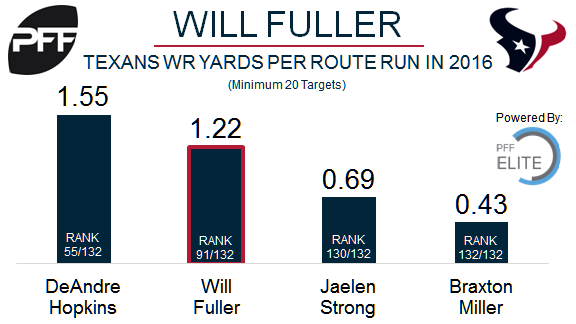 Fuller was drafted by Houston in the first round in 2016 and played 959 snaps as a rookie. His PFF grade of 50.9 ranked him 95th out of 115 qualifying wide receivers last season. Last year, 34.5 percent of Fuller’s targets were on deep passes (targeted 20-plus yards downfield), the fourth-highest deep pass rate of wide receivers with at least 20 deep targets. He dropped six of 53 catchable passes last year, for the sixth-worst drop rate of wide receivers who were targeted at least 80 times.